Help us make accurate forecasts about the business and technology strategies, tactics and trends that impact your organization, now and in the future. The information you provide will be treated in the strictest confidence and only reported in aggregate with other respondents. Your name and company will never be made public. Learn more about Cutter's research methodology. Customer expectations have never been higher, and they are forcing companies and organizations across almost every industry to rethink their approaches to commerce, marketing, sales, and, in particular, customer engagement, service, and support. As a result, organizations have taken a great deal of interest in all things related to the experience customers encounter when dealing with their business. To meet such increasingly elevated customer expectations, organizations are implementing detailed strategies for distributing customer experience (CX) practices across the organization. Organizations are also making huge investments in leading technologies designed to enhance the CX, regardless of on which channels customers choose to engage with them. We are also seeing cutting-edge technologies such as AI, ML and IoT that provide advanced capabilities for implementing intelligent CX applications. But while almost everyone can agree that providing a great CX is essential for any organization seeking to remain competitive today, actually implementing CX strategies and practices can be difficult and confusing. Consequently, we are conducting a survey on how organizations are adopting or planning to adopt CX management practices and technologies and what they see as the possible impacts on their businesses. In particular, we want to determine the actual current status of CX efforts within organizations and what their plans are for utilizing CX in the future. We also want to hear from organizations as to what they see as the benefits and opportunities offered by CX practices and technologies and if they are actually achieving such benefits as a result of their efforts to date. Perhaps most important, we want to identify which specific CX practices and technologies they are using, and the important trends, issues, and other considerations organizations are encountering in their CX efforts. Traditional business and operating models are being digitally disrupted, forcing companies to quickly transition to new ways of doing business. And while not all businesses are equally at risk, every business is exposed to the new order digitization is bringing. In the midst of this turbulence, leading-edge firms, from startups to the Fortune 10, are recognizing that business agility is an essential part of survival. Enterprises that operate in an agile fashion have a huge advantage — traceability from the team level back to the CEO. When team decisions map to the company’s key business drivers and priorities, the synchronization of effort serves as a powerful antidote to the relentless pace of change. The resulting efficiencies lead to cost savings, increased bandwidth for vital innovation, and much faster response to market changes and shifting customer demands. So why wouldn’t every organization embrace agility? And of those that have, how successful are they? On a practical level, how are agile efforts being organized and funded? What are the critical success factors in attaining business agility? What challenges are organizations finding as they strive to achieve agility from the team level to the C level and across the enterprise? 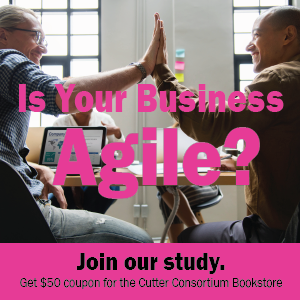 To answer these and other questions, Cutter Consortium is conducting a survey on how organizations are adopting agile practices — from the team level all the way to the C level; from software development, to sales, marketing, and even the factory floor — to achieve business agility. We’re interested in the challenges they are encountering and the impacts they can measure. Our goal is to identify important trends, keys to success, and pitfalls to avoid. And then share these with you! All answers will be kept confidential. (Bonus: if you supply us with your email address, we'll send you a coupon good for US $50 in the Cutter Consortium Bookstore.) To enrich the findings, we’d like to conduct short interviews with a subset of respondents. Your comments will be kept anonymous, identified by title and industry only. 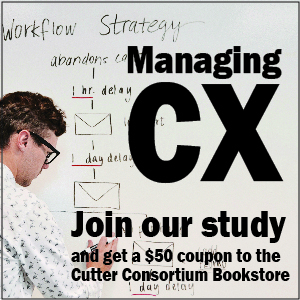 So, if you’d like to chat with us (and get an additional US$100 Cutter Consortium bookstore certificate), please “check the box” on the survey.